Solomon BINGHAM, son of Caleb BINGHAM, a noted teacher and book-seller, afterward of Boston; born at Salisbury, Conn., in 1770; graduated at Dartmouth College in 1791; studied law with Darius CHIPMAN, and admitted to the Rutland county bar, it is supposed, in 1793. He removed to Franklin county, Vt., in 1796, where he was chief justice of the Franklin County Court in 1813. He died in 1840, aged seventy years. John KELLOGG, the oldest son of John and Roxana (MATOON) KELLOGG, of Amherst, Mass., was a descendant in the fifth generation, from Joseph KELLOGG, one of the first settlers of the town of Hadley, of which the town of Amherst originally formed a part. He was born at Amherst, May 31, 1786. In 1805 he came to Vermont, and on the suggestion of Captain Silas WRIGHT, of Weybridge (the father of the eminent senator and governor of New York, who had been an old neighbor of his father at Amherst), he determined to study law. He pursued his studies in the offices of Loyal Case KELLOGG and Hon. Horatio SEYMOUR, at Middlebury, and was admitted to the Addison county bar in 1810. During his entire course of professional studies he supported himself by his own exertions. He began the practice of his profession at Benson May 24, 1810, which he pursued for thirty years with diligence and success and had a large and valuable professional business, from which he retired in 1840, and spent the rest of his life in agricultural pursuits. He died December 22, 1852, aged sixty-six years. He was postmaster, 1813 to 1822; town clerk, 1822 to 1828; member of the State Constitutional Convention in 1822, and representative in the Legislature in 1822, '24, '25, '27, '28, '29, '30 and '31, and in 1830 was speaker pro tempore of the House. From 1825 to 1831, brigadier-general of the State militia; in 1838 the Democratic candidate for United States senator and delegate-at-large to the Democratic National Conventions in 1840 and 1844. He was a man of great industry, methodical habits of business and clear and sound judgment, and brought to the discharge of public and private duties great sincerity and integrity. He was three times married and his son, Loyal C. KELLOGG, was long time an eminent judge of the Supreme Court. David L. FARNHAM, born in Benson in 1803; graduated at Middlebury College in 1823; studied law with John KELLOGG; admitted to the bar in 1826, and practiced in Benson until 1828, when he removed to Enosburgh. Vt., and subsequently to Manlius, N. Y., where he died a few years since. Ira HARMAN was born in Pawlet in 1781; studied law with Nathaniel HARMAN, and admitted to the bar in March, 1800; settled in Benson in 18 1810; and practiced his profession about twenty years; for many years was a sufferer from chronic hypochondria, and died July 17, 1837, aged fifty-six years. Marshall R. MEACHAM was born in Benson in 1798; studied law with John KELLOGG, and was admitted to the bar in June, 1825; practiced until his death in August, 1833, aged thirty-four years. Samuel JACKSON was admitted to the bar in 1801, and settled in Benson, and removed to Ohio in 1804. Milo W. SMITH was born in Benson in 1800; studied law in Vergennes, and was admitted to the Rutland county bar in September, 1832; and was in practice until when he removed to Plymouth, Indiana, where he died. Loyal Case KELLOGG was born in Benson February 13, 1816. His father was Hon. John KELLOGG, long a prominent member of the Rutland county bar. Loyal graduated from Amherst College in 1836, and soon afterward entered the office of Phineas SMITH, of Rutland, finishing his studies with his father in Benson. He was admitted to the bar in 1839 and began practice at once in Benson. He remained there until 1859, when he was elected judge of the Supreme Court, and removed to Rutland in 1860, returning to Benson in 1868. He represented Benson in the General Assembly in 1847, 1850, 1851, 1859 and 1871, where he attained a position among the foremost members. He was delegate to the Constitutional Conventions of 1847 and 1870 and was one of the eight delegates from Rutland county to the Constitutional Convention of 1857, of which he was elected president. The degree of Doctor of Laws was conferred on him by Amherst College in 1869. He was elected judge of the Supreme Court in 1859, and annually re-elected down to and including 1867, declining the last election. He was a fluent writer, the history of Benson, in the Vermont Historical Magazine, and much general literature, being from his pen. He was an able legislator and occupied a place in the front rank of the legal profession. He died at the family homestead in Benson, November 26, 1872. In addition to these, of whom sketches have been given, the following attorneys have practiced in Benson: Albert STEVENS, the first lawyer in the town, practiced two years (1800 1802); was admitted in Chittenden county in 1799. Samuel JACKSON began practice in about 1807, but soon left. Both of these are said to have not borne good characters. Ira HARMON settled here in 1810 and continued practice about twenty years. John KELLOGG, father of Loyal Case KELLOGG, settled in Benson in May, 1810, and practiced until 1840. Marshall R. MEACHAM began practice here in 1825 and continued to his death in 1833. David L. FARNHAM practiced from 1826 to 1828, and died in Manlius, N. Y., to which place he removed. Richard W. SMITH practiced one year, 1830. Milo W. SMITH was in practice from 1831 to 1852, when he removed to Indiana, and there died. Ebenezer N. BRIGGS was born in Marlboro, Mass., in 1801; studied law with Gordon NEWELL at Pittsford, and was admitted to the bar in December, 1823, and settled in practice at Salisbury. He represented that town in the Legislature from 1831 to 1835, and was speaker of the Assembly from 1834 to 1836. He was a member of the first Senate of Vermont from Addison county in 1836-37 and '38, and was the first president of the Senate. He was State's attorney of Addison county from 1831 to 1840, and a member of the Constitutional Convention in 1828. Mr. Briggs removed to Brandon in 1840, and became equally prominent as a lawyer and in political affairs. He was representative in 1845 and 1848, and was speaker of the House both years. He was also senator from Rutland county three years, 1842 to 1844. He was also State's attorney two years. He was a lawyer of wide practice up to near the time of his death. He died at Brandon. Rodney V. MARSH, of Brandon, was born July 11, 1807, and became conspicuous in the legal profession. 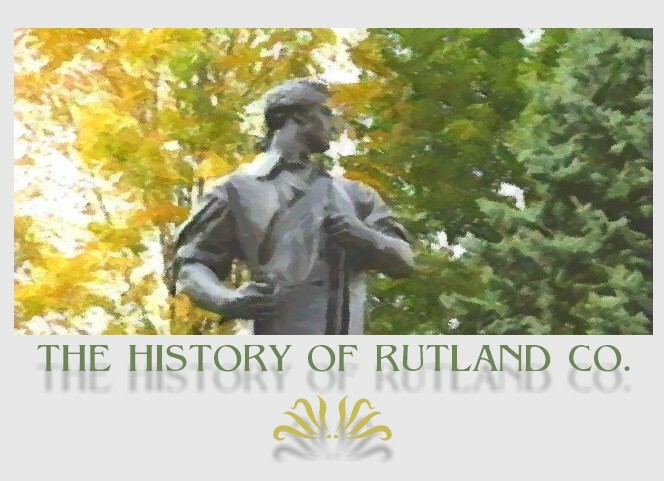 He went to Brandon in 1832, after having studied with Rodney C. ROYCE and Silas H. HODGES, in Rutland. He was an ardent politician, was elected to the Legislature in 1856, 1857 and 1858, and took an active part in the debates of those sessions. He was a man of broad culture, extensive reading and excellent natural talent. He died March 8, 1872, at Brandon. Samuel D. WING was born in Rochester, Windsor county, Vt., February 4, 1823; educated at the Vermont Literary and Scientific Institution; studied law with Hon. Ezra JUNE and Hon. Milo L. BENNETT, and admitted to the bar in 1844. After a few years' practice at Brandon, abandoned the profession and became connected with railroads. He died at Brandon, November 6, 1863. Barzillai DAVENPORT was a native of Dummerston; studied law with Hon. John LYNDE, of Williamstown, and located in Brandon in 1822; he remained there in practice forty-six years, forty-one of which he was town clerk. He was justice of the peace twenty-eight years; representative in the Legislature 1854-55; one of the assistant judges of the County Court in 1855-56 and 1857. He was much respected as a man and stood high in his profession. Other attorneys who practiced in the town of Brandon were Elijah PARKER, Willard J. PARKER, Charles L. WILLIAMS, Samuel N. CONANT and A. A. NICHOLSON. Hon. Chauncey LANGDON was one of the conspicuous members of the legal profession in Rutland county. He was born in Farmington, Conn., in 1764, and graduated from Yale College in 1792. His law studies were pursued with judge GILBERT, of Hebron, Conn., after which he came to Castleton, and there resided until his death in July, 1830. In 1789 and 1800 he was probate judge for the Fairhaven district; was elected a trustee of Middlebury College in 1811; was a Member of Congress in 1815-16. At the time of his death he was one of the State councilors, and was otherwise honored by his constituents. It was said of him by one who knew him well; "To the members of the profession to which he belonged, he has left an example of unyielding integrity, persevering diligence and prudent discretion, worthy of their highest respect and imitation." Hon. Benjamin Franklin LANGDON was a son of the above; born in Castleton October 12, 1798; graduated at Union College in 1818 and from the Law School in Litchfield, Conn., in 1820; was admitted to the Rutland county bar in 1821 and practiced until his death, May 31, 1862. In 1837 he was appointed register of probate for the district of Fairhaven, holding the office until 1845. In 1852 he was elected one of the County Court judges, and retained the office until 1855. As a lawyer he was well read and a safe and judicious counselor. Abiel Pettibone MEAD was born in Rutland, April 12, 1789, and graduated at Middlebury in 1813. He first read medicine with Edward TUDOR, of Middlebury, and attended lectures in Philadelphia; but he practiced medicine only a few months, when he began reading law with Hon. Chauncey LANGDON, of Castleton, and practiced there until his death, July 28, 1839. He was register of probate for the district of Fairhaven from 1814 to 1823 and from 1829 to 1837; representative from Castleton from 1831 to 1833, and State's attorney for Rutland county from 1829 to 1835. Other attorneys who attained some prominence in the town of Castleton were Hon. Isaac T. WRIGHT, who was admitted in 1832 and practiced until his death in 1862, at the age of fifty-three. He was an assistant judge, and represented the town in the Legislature in 1859-60. Hon. Almon Warner, born in Poultney in 1792, admitted to the Rutland county bar in 1825; removed to Castleton in 1831; register of probate from 1824 to 1829, and judge of probate from 1831 to his death in 1861. Selah H. MERRILL, born in Castleton in 1795; graduated at Middlebury 1813; studied law with Hon. Chauncey LANGDON and admitted in 1816. He died in 1836; was register of probate from 1830 to 1839; State's attorney from 1830 to 1835; he is remembered as a man of exceptional talents and high standing. Robert TEMPLE was a native of Braintree, Mass., born in 1783; studied law with Hon. Chauncey LANGDON and admitted in 1804. He settled first at Castleton and subsequently removed to Rutland, where he died in 1834. He was clerk of the County Court from 1803 to 1820. Hon. Silas H. HODGES, son of Henry HODGES, of Clarendon, was born in 1804, and graduated from Middlebury College in 1821; he was admitted to the bar in 1825 and with the exception of a few years, from 1833 to 1841, when he was employed in the ministry, followed his profession in Rutland until 1861. At the latter date he was appointed to a position in the patent office. Spencer GREEN was a native of Clarendon; studied with W. H. SMITH, finishing in Wallingford; after his admission he practiced in Rutland to about 1850, when he removed to Danby. He joined the Union army and died from disease contracted in the service. Among the attorneys who practiced in Danby and have died, may be mentioned the following: Hon. Morris H. COOK, born in Chester in 1816; studied with Oramel HUTCHINSON, of Chester, and began practice in 1840; in 1845 came to Danby and was admitted to the bar of Windsor County Court in 1844, and to the Supreme Court of Rutland county in 1847. He was elected assistant judge of the County Court in 1858, and left a lucrative practice to serve in the Seventh Regiment during the Rebellion. Jonathan C. DEXTER, born at Jay, N. Y., in 1810, studied law with Hon. A. L. BROWN, in Rutland, and went to Danby in 1831; practiced there five years and several years in Rutland, and in 1849 went California, where he died. Charles E. BOWEN was born in Boston, Mass., in 1816; graduated at Middlebury College in 1836; studied law with Salmon WIRES, and was admitted to the Lamoille county bar in June, 1844, and practiced a few years at Danby. William C. KITTREDGE, son of Dr. Abel KITTREDGE, was born in Dalton, Mass., February 23, 1800; graduated at Williams College in 1821, and studied law with Hon. E. H. MILLS and Hon. Lewis STRONG, of Northampton; was admitted to the bar in Kentucky in 1823, returning to Fairhaven in 1824, in December of which year he was admitted to the bar of this county. He represented the town in Legislature eight years; was senator two years; two years speaker of the House of Representatives; five years State's attorney; six years judge of the County Court; one year judge of the Circuit Court; one year lieutenant-governor, and seven years assessor of internal revenue. All of these posts judge KITTREDGE filled with ability and honor. He died in Rutland while on his way to Bennington, June 11, 1869. John BURNAM, the first lawyer to settle in Middletown, deserves the attention of the biographer. He was born in Old Ipswich, Mass., in 1742, and came to Bennington the first year of its settlement, 1761. In 1765 he removed to Shaftsbury, and although he had not received more than a few weeks of schooling, he was prompted to read up a little on law, on account of having been worsted in a case growing out of the New Hampshire Grants trouble. He accordingly secured a few law books, and so persistently did he study that in a short time he became a prominent "pettifogger." From 1771 to 1779 he was engaged in mercantile business in Bennington, then returned to Shaftsbury where he remained until 1785; was a member of the conventions of 1776-77, which declared the independence of Vermont, and was one of the committee to draft the declaration; he represented Bennington in the Legislature at its first session. He was engaged in the trial of many of the earliest cases in the Bennington County Court, and being generally successful he was induced by Nathaniel CHIPMAN and Stephen R. BRADLEY to take the attorney's oath, which he did. He represented Middletown six years and died August 1, 1829, aged eighty-seven years. Hon. Orson CLARK, son of Enos, and grandson of Jonas, was born in Middletown February 2, 1802. He taught school several seasons and studied law with his uncle, Jonas CLARK, and was admitted to the bar at Rutland in September, 1828; he practiced in Middletown until his death in 1848; he represented his town in 1835-36; was town clerk from 1836 to 1842 inclusive, and one of the senators from this county in 1840-41. General Jonas CLARK was the third son of Jonas, sr., and was sixteen years old when his father settled in Middletown. His entire school education consisted of learning to read. His father being poor, the son learned the mason's trade, which he followed until he was thirty years old, occupying his evenings and leisure in reading and study; thus he obtained most of his legal education, and was admitted to the bar not long after he reached thirty, and soon gained a large practice. He held the office of State's attorney sixteen successive years; was assessor and collector of government taxes in 1819; represented Middletown eighteen years; was justice of the peace forty years; was candidate (Democratic) for governor in 1849, and a member of three Constitutional Conventions. As a lawyer he ranked high and always made the preparation of his cases a subject of deep study. He died at Middletown February 21, 1854. He had three sons, Merritt (now living in Middletown), Horace and Charles. Barker FRISBIE was the youngest son of Joel FRISBIE, of Middletown, and studied law with General Jonas CLARK, of that town; was admitted to the Rutland bar in 1814, and practiced in Middletown until his death, which occurred in February, 1821. He was elected town clerk in 1815 and held the office until his death. He was a close student, a man of good judgment and gained the respect of the community. Other Middletown attorneys who have left forever the field of action, were Ahiman Lewis MINER, son of Deacon Gideon MINER, jr., who studied law with MALLARY & WARNER, Poultney, and ROYCE & HODGES, Rutland; he was admitted to the bar in 1832; began practice in Wallingford, but removed to Manchester in 1835. He was eight years probate register and three years probate judge of his district; two years in the Legislature; nine years a member of the House or Senate; five years State's attorney for Bennington county, and two years Member of Congress from this district. Roswell BUEL, jr., was admitted to the Rutland county bar in I845, but did not practice in the later years of his life. Hon. Jonathan BRACE was, doubtless, the first attorney to settle in Pawlet. He was a member of the Council of Censors in 1785, and returned to Connecticut a few years later. Nathaniel HARMON practiced law in Pawlet for forty years, and won the esteem of his brethren. Much of that long period he was the only attorney in the town. He was a member of the Council of Censors in I834, and of the Constitutional Convention in 1836. He died in I845, aged sixty-five years. Hon. Noah SMITH, brother of Governor Israel SMITH, practiced a few years in Pawlet, going there in the early years of the Revolution; and Hon. Leonard SARGENT, practiced a short time in the town, and then removed to Manchester. Truman SQUIER, another attorney in the town at an early day, removed to Manchester about 1800 where he became prominent. Other lawyers of the town, of whom details are not available, were Daniel CHURCH, who practiced here for a time; afterward in Arlington and Bennington, and died in Toronto; Nathaniel HARMON and Nathaniel HAMBLIN, both of whom removed to Ohio after a few years' practice; and George W. HARMON, who succeeded his father, Nathaniel, and removed to Bennington. Gordon NEWELL began practice in Pittsford in 1804. He studied with Seth STORRS, of Middlebury, and was admitted in 1801. He continued practice until late in life and died July 3, 1865, aged eighty-six years. His education was not very thorough, but his native talents and great energy enabled him to succeed to a remarkable degree. He represented the town in the Legislature in 1818 19 and was assistant judge of the County Court in 1847-48. John PIERPOINT, born in Litchfield, Conn., in 1806; studied his profession in the Litchfield Law School and was admitted to the Rutland county bar in April, 1827. He at once began practice in Pittsford and three years later removed to Vergennes. He arose to the office of chief justice of the Supreme Court of Vermont. John G. NEWELL and James R. NEWELL, both sons of Gordon NEWELL, studied law and were admitted, the former in 1831 and the latter in 1832. John G. practiced in Pittsford until his ill health forced him to abandon the profession. James R. practiced with his father a few years and died August 20, 1864. Lyman GRANGER was born in Salisbury, Conn., 1795; graduated at Union College in 1820; studied law with Moses STRONG, and admitted to the bar in December, 1821; retired from practice in 1826. Represented Pittsford in 1826-27. Died in 1840, aged forty-five. James SATERLEE studied law with John COOK, and was admitted about 1800, and was the first lawyer of Poultney; removed to New York in 1808. Hon. Zimri HOWE was born in Poultney in 1786 and graduated from Middlebury College in 1810. He studied law with judge SEYMOUR, of Middlebury, settled in Castleton, where he continued to practice until his death in 1862, at the age of seventy-seven years. He was State senator in 1836-37 and one of the assistant judges of the County Court from 1839 to 1844. Although his life was not a public one to the extent that fell to the lot of many others, it was none the less useful. He was earnest and efficient in supporting and improving the schools, and was a trustee of the Rutland County Grammar School for many years, as well as a member of the corporation of Middlebury College. He was also a zealous advocate of the temperance cause, and all benevolent societies found in him a strong supporter. Hon. Rollin C. MALLARY was one of the most eminent of the early members of the county bar. He was born at Cheshire, Conn., May 27, 1784, and resided there until 1795, when he came to Vermont, locating with his parents in Poultney. He graduated from Middlebury College in 1801, and such progress had lie already made in his professional studies that he was admitted to the bar in this county in March, 1807. The next October he was appointed by Governor SMITH as secretary of the governor and council. He afterward held the same office from 1809 to 1812 and from 1815 to 1819. He soon took rank among the ablest lawyers in the county and was given the office of State's attorney from 1811 to 1813 and in 1816. He was defeated for Congress in 1819, owing to the fact that the votes of several towns were not returned early enough to be counted. He contested the seat and was successful. So ably did he fill the high office that he received six successive re-elections, and his services were of the highest value. He lived in Castleton until about the time of his going to Congress. He died in Baltimore April 15, 1831. Moses G. NOYES, son of Moses, born in Duchess County, N. Y., in 1794; graduated a Middlebury in 1819; studied law with David RUSSELL in New York State and was admitted in 1825. He practiced in Poultney about four years and then removed to New York. He died in 1832. William BUELL, born January 12, 1835; graduated at the University of Michigan in 1853 and studied law with J. B. BEAMAN, of Poultney, and admitted in Rutland county at the March term of 1857. He never practiced here, having taken up the study of theology, and died September 11, 1859. James S. HARRIS was born in Canaan, N. H., January 7. 1788 He studied law with Richard Skinner, in Manchester, Bennington county, and was admitted to the bar of that county in 1812. He came to Poultney probably not long afterward and secured a good practice. He died March 11, 1866. Hon. Elisha WARD, born June 20, 1804, in East Poultney; won a high position in the profession. He studied with Judge WOODS, of Granville, N. Y., and passed most of his life, when not filling public office, in western New York. Julian GRISWOLD, born in Poultney in 1804, studied law with Hon. Chauncey LANGDON, of Castleton, after having graduated from Castleton Academy. He practiced in Whitehall from 1828 to 1833, went South and died in Georgia in 1836. Alexander Woodruff BUEL, born in Poultney in 1813, fitted at Castelton and read law with Jabez PARKHURST, of Fort Covington, J. G. BUEL and Hon. B. F. LANGDON, of Castleton; removed to Detroit in 1834, and became eminent in politics. Hon. Darwin A. FINNEY was born in Shrewsbury November, 1814; studied law with H. L. RICHMOND and was admitted to the bar in 1841. He spent his active life in Meadville, and died there after having attained eminence in his profession. He held several high offices in his adopted town. Obadiah NOBLE, of Tinmouth, was a native of New Hampshire, and was brought to Tinmouth when a child, and died there in 1864 at the age of eighty-seven years. He was justice of the peace thirtyeight years; register of probate in 1799; judge of probate from 1814 to 1828, and assistant judge of the County Court from 1839 to 1842 inclusive; represented the town in Legislature six years, and was senator from the county in 1838-39; was member of the Council of Censors in 1827 and member of the Constitutional Conventions of 1828 and 1836. He was a man of strong character and intellect. Henry BALLARD, now in practice in Burlington, is a native of Tinmouth, born in 1836; graduated at the Vermont University in 1861, and from the Albany Law School in 1863; was admitted in September, 1864. Brandon, George BRIGGS, Henry C. HARRISON, Edward S. MARSH, Eben J. ORMSBEE, W. P, WHEELER. Castleton, J. B. BROMLEY, H. L. CLARK, M. H. COOK, John HOWE, M. J. HARRINGTON. Fairhaven, George M. FULLER, W, H, PRESTON, C. M. WILLARD. Poultney, John B. BEAMAN, Barnes FRISBIE, E. S. MILLER, F. S. PLATT, Elijah ROSS, W. H. ROWLAND. Pawlet, Fayette POTTER, D. W. BROMLEY. Rutland, Wayne BAILEY, Joel C. BAKER, James BARRETT, James C. BARRETT, Fred. M. BUTLER, A. G. COOLIDGE, Edward DANA, Walter C. DUNTON, Edwin EDGERTON, Henry HALL, Henry A. HARMAN, Charles L. HOWE, David N. HAYNES, P. R. KENDALL, G. E. LAWRENCE, P. M. MELDON, Edward D. MERRILL, Edward R. MORSE, Thomas W. MALONEY, D. E. NICHOLSON, Frank C. PARTRIDGE, John PROUT, Redfield PROCTOR, L. W. REDINGTON, Warren H. SMITH, Henry H. SMITH, F. G. SWININGTON, John D. SPELLMAN, Reuben R. THRALL, W. G. VEAZEY, Aldace F. WALKER, Charles K. WILLIAMS. East Wallingford, Henry P. HAWKINS. West Rutland, Joseph E. MANLEY, W. B. BUTLER, E. D. REARDON. Brief records of these attorneys will be found in the various town histories. Biographical Sketches of Some of Its Prominent Men & Pioneers"
Edited by H. Y. Smith & W. S. Rann, Syracuse, N. Y.